Los Angeles Garage Flooring has become LA’s #1 Choice for top quality Garage Flooring and Garage Floor Coating Solutions. With our highest priorities on customer service, professionalism, affordable prices, exceptional products, top notch workmanship and extraordinary attention to detail, Los Angeles Garage Flooring is determined to far exceed your highest expectations. Whether you are a homeowner who always dreamed of a gorgeous showroom quality garage floor, a homebuilder needing exceptional flooring solutions, a car dealer or auto shop needing that 21st century look or even an airplane enthusiast looking to resurface an entire airplane hangar, Los Angeles Garage Flooring looks forward to helping you make your vision a reality! More than anything, our clients love the “High Gloss” powerful shine they get when we are finished with the garage floor resurfacing process. This coupled with the ability to choose from a wide variety of colors and pattern styles will surely allow you to pick the winning combination. Los Angeles Garage Flooring employs a cutting edge, specially formulated and trademarked Epoxy Floor Coating solution called Spec-Tech™ which creates the most brilliant shine while far exceeding the durability standards of most flooring products. Easy to clean, resisting stains and tire markings, highly durable and maintaining a long lasting shine, Spec-Tech™ Epoxy Floor Coating products will beautify and protect for years to come. 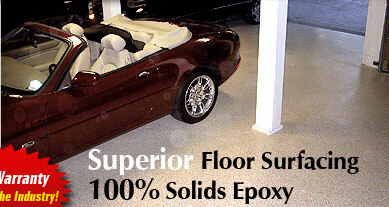 Los Angeles Garage Flooring provides high quality garage flooring and epoxy coating solutions for the following Los Angeles Metropolitan areas: Los Angeles, West LA, Hollywood, West Hollywood, Hollywood Hills, Beverly Hills, Bel Air, Brentwood, Westwood, Century City, Holmby Hills, BH Post Office, Beverlywood, North Hollywood, Studio City, Burbank, Sherman Oaks, Encino, Tarzana, Woodland Hills, Calabasas, Agoura Hills, Thousand Oaks, Camarillo, Moorpark, Simi Valley, Bell Canyon, Canoga Park, Chatsworth, Porter Ranch, Granada Hills, Northridge, Reseda, Lake Balboa, Panorama City, Pacoima, Sun Valley, Tujunga, La Canada, Pasadena, Glendale, Los Feliz, Silverlake, Silver Lake, Echo Park, Hancock Park, Culver City, Westchester, Playa Del Rey, Marina Del Rey, Venice, Santa Monica, Pacific Palisades, Malibu, Topanga, Manhattan Beach, Seal Beach, Huntington Beach, Laguna Niguel, Buena Park, Fullerton, Yorba Linda, Anaheim, Orange, Irvine, Costa Mesa, Rancho Santa Margarita, Mission Viejo, Ladera Ranch, Coto de Caza, San Juan Capistrano, Dana Point, San Clemente, Aliso Viejo, Santa Ana, Tustin, Laguna Beach, Laguna Hills, Fountain Valley, La Habra, Brea, Placentia, Ontario, West Ontario, Inglewood, Torrance, Palos Verdes, Long Beach, Garden Grove, Hacienda Heights, Santa Clarita, Valencia and more. Call us today and we can be at your location fast to give you a free estimate! Copyright 2015. Los Angeles Garage Flooring.com All right reserved..